Keeping with my American recipe, and my American background I’ll stick to calling this bread what I’ve known it as my whole life. Why make the change to courgette? This is a delicious bread that’s great for after dinner, snack time, or even dessert. I’ve cut down on some of the calories and fat by substituting the oil with cranberry and apple sauce. This keeps the moisture in the bread and helps it cook. Alternatively you can substitute the white sugar with a sugar substitute to further decrease the calorie count. Makes 1 loaf, but easily doubled for two. Sift together all dry ingredients in a medium bowl, flour, salt, baking soda, baking powder, cinnamon. Next combine eggs, sugar, vanilla, cranberry sauce, apple sauce, grated zucchini and almonds. Slowly mix together the flour until completely incorporated. Pour in a greased loaf pan and put into a 350F (180C) oven, and cook for about 45min-1hr. I love peppers, who doesn’t love peppers? I have to say they’re one of the most versatile and nutritious ingredients that I use in almost every dish that I make. With one red pepper containing loads of vitamins along with your daily requirement of vitamin c they’re something more people should consider using, unless of course you’re allergic. The peppers along with tomatoes belong to a family called the nightshades. They’re known to cause some uncomfortable side effects and some people stay away from this class of vegetable. But if you try this recipe it would make an excellent starter, side dish, or even a main meal with a salad. Dice: celery, onion, garlic, parsley, sun dried tomato. Set aside. In a bowl place the cous cous and all the diced vegetables on top including the saffron. Pour the hot stock over the cous cous and cover tightly with cling film. Let this sit untouched for 10-15 minutes. In a baking dish, arrange your peppers. I like to cut them in quarters because they can be quite big. When the cous cous is done remove the cling film and carefully scoop into pepper shells. When the peppers are completely full and the cous cous is gone, pour the chopped tomatoes all over the top. Sprinkle with the oregano and basil, top with the mozzarella. Cover tightly with foil and bake at 200C (400F) for about 45 minutes or until they’re softly roasted. You can opt to take off the foil the last few minutes of baking and get a nice colour on the mozzarella. So this is the recipe I talked about making last weekend. It came out just as I expected it, delicious succulent meaty and juicy. The meat could not have fallen off the bone more delicately and it was exactly what the doctor ordered in my house. Although this isn’t going to be on my weekly menu as I’ve got a very strict restriction on meats, it will definitely be a wonderful treat throughout the winter months. 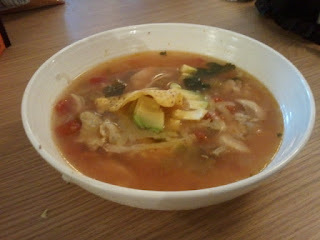 This recipe serves 2 as I cooked it for two, but if doubled it would be just as good for 4 people, enjoy! Note: I can’t stress enough, to cook this dish you need an oven-proof casserole, or else you’ll be melting your cookware! Take a dinner plate out and put the flour on the plate. Lay the lamb shanks on the flour and hit them with salt and pepper, then roll them in the flour. Setting aside leaving them to rest and get the chill off. Peel and chop the carrots into large chunks. Chop the onions in to large chunks as well. Peel the garlic but do not chop. Dice the tomatoes but set aside. Heat the casserole dish with the oil. When hot lay the shanks down and brown on all sides for about 10 minutes. Add the carrots, potatoes, garlic, rosemary, thyme sprigs, garlic, and give a few turns in the pan. Add the stock, wine, and tomatoes last. Bring to a boil and put into an 180C oven for about 1 ½ - 2 hrs. It’s worth the wait. Over the past weekend I was just in the shop getting a few things and I decided I wanted to try my hand at a very meaty and potatoes dish, so I had my eyes on a bone on piece of something to cook. I stumbled across lamb shanks. I’ve never cooked lamb shanks before but I had a good idea of what to do with them, and instantly started my mind going. They were so big I didn’t know how to even cook them. I have several shallow casserole dishes, that to be honest aren’t even worthy of cooking a proper casserole or lasagne in, too shallow and messy, especially for this mighty bone of a job. My husband is putting up with me running around the store chucking things in the basket that I might need, herbs, spices, flavours running through my head, how do I make it fast? How do I make it easy? Two things that never escape my mind while running around juggling ingredients. Trying to decide what you’re going to put in something to make it taste just exactly as you taste it in your head takes a toll on the ‘ol hubby following around. The bit that has his attention at high, is the lamb shanks he’s carrying around in the basket. As I’m going through the flavour profile that I want, which is always simple and fresh, I’m still thinking on what I’m going to cook these ginormous shanks in! What will fit the potatoes, and carrots I want to add, plus all the delicious jus! And then I pass it…the aisle with all of the home ware on it. Mind you it’s not a great aisle, and it’s just my local supermarket, but it just crossed my mind to go and peek to see if they had anything applicable. Usually I’m picky about my home wares. I like to buy things that are going to prove to be quality and have multiple uses. I would never buy one single thing with the intention of using it for one thing. I stumbled upon this huge cream coloured casserole dish and almost exactly what I wanted, minus the trendy posh ‘Le Cruset’. Who needs a logo when you can see right in front of you, that the £29.99, solid cast iron casserole that could take someone’s foot off if dropped, wasn’t all you ever wanted? It was nearly half the price of a high priced one but with all the same materials. Cast iron speaks for itself ladies and gents; if it looks sturdy and good then it probably is good, no matter where you purchase it. In my recent acquisition of new parts for my well-oiled kitchen, I attained some ceramic pots from France that is the most adorable addition to my kitchen. I received them as a birthday present and have tried them out only as soufflé pots but when I get a blow torch it’s on for crème brulee. 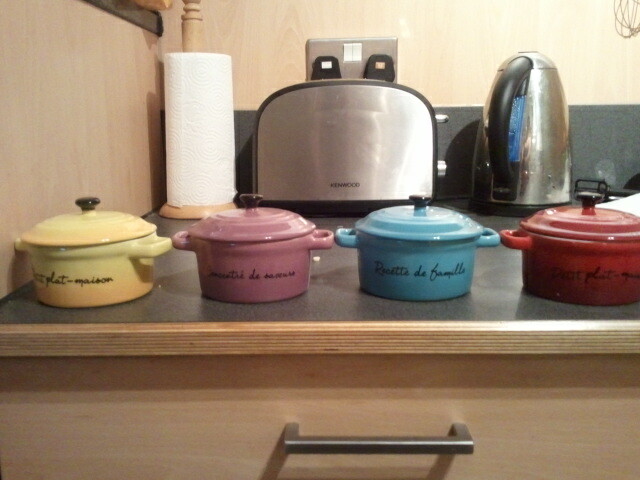 Seems that I have the French theme going on in my kitchen right now, what am I going to make next, a coq au vin? All that I know is that my mind is on cooking, and getting the right pots gets me excited to make the best food I can make, and make it profitable! What you use in your everyday life should reflect in your cooking. If you hate your utensils then get new ones and find a peace with the food that you create and be the master in your kitchen! Look out for my lamb shanks and soufflés. I grew up with this recipe as a very big staple in our meal regime. We would eat this at least two times a month, with tortillas and fresh Spanish rice and refried beans just like mom would make it. But I know perfectly well that it’s not easy cooking like your mom or grandma but I decided to try my hand at it anyway, to remake this classic Tex-Mex recipe. Note: This goes excellent with my Simple Spanish Rice. Serves 4. Dice the beef if not in cubes. Slice onion, pepper, chili, and garlic. Prepare the stock 1 cube to 2c water. Throw the beef, onions, pepper, chili and garlic in. Sauté for 5-7 minutes until meat browns. Add the flour and spices, and cook for a further 5 minutes, being careful not to burn the flour. Add half the stock and tomato puree and stir, add as much stock as you need to get to the thickness you like (I start off with half the stock to make sure it doesn’t get too thin). Simmer on the hob for about 15-20 minutes until meat is completely cooked through and tender. Serve with tortillas and my Simple Spanish Rice. This is a technique that’s very easy to use, and maybe one that some people forget to use, I know I did. I was tired of just oven baking a fish and constantly watching it to make sure that the fish was getting done without overcooking, and then I just remembered that I could wrap individual portions into parcels and bake in the oven at a set time and the steam and moisture would cook and keep moist whatever was in the packet. You could really use your imagination with this as any vegetable can go inside with whatever seasoning you like. This is my recipe and it serves the two of us but since it’s in parcels you just adjust the ingredients as needed. Shell all the broad beans. Blanch them for 3-5mins in boiling water. Take them out and put in cold ice water to stop the cooking process. Peel the outer layer of skin off the beans to reveal a bright green bean, set aside. Note: This is a timely but rewarding process; you could easily skip it and try this recipe with any other type of bean, such as French. Chop garlic, parsley finely and add to bowl. Next lemon juice, olive oil, salt, pepper and broad beans and mix thoroughly. Set aside and let sit 5 minutes. Lay out sheets of foil big enough to double over and fold in the packet contents securely without any air getting free. Lay down the fish pour a portion of the tomato, broad bean mixture on top and secure tightly. Bake at 200C or 400F for about 20-30mins. This recipe was adapted from the typical meat and potatoes approach to dinner. I wanted to try and lighten it up to where I didn’t have to feel so weighted down after a meal by potatoes. I decided to try the cauliflower and now we have it every time. It’s really a great side dish as well even if you don’t want to replace the potatoes. Cut florets off the cauliflower, cutting around the bitter core. Slice and clean thoroughly the leeks, and if using onions just chop them. Toss everything in a steamer and steam for about 10 minutes or until everything is very soft. When everything is soft, blitz in a food processor or hand held blender with the cream. Salt and pepper to taste. My suggestion is to serve immediately with a hot steak and marinated mushrooms. Note: Although this is really easy, I suggest you use a steamer to cook the cauliflower, rather than boiling it because it prevents a watery texture. If you have to boil it, use a paper towel to make sure it’s completely dry when you begin to mash. If you don’t have a food processor or a handheld blender, you could put some elbow grease into it and mash it up with a potato masher. Enjoy! So this dish is traditionally an Italian stew, but I just happened to have these ingredients and jazzed it up with a few spices and it really is the simplest one pan meal for a family. I made mine and served it on wholegrain rice to give it an extra burst of nutrition. Serves 4. Heat a pan with some of the oil, while it’s getting hot salt, pepper, garlic powder one side of the chicken breast. When the oil is hot lay the seasoned side down, and season the side flipped up. Let those brown in the pan for about 4-5 minutes per side. As the chicken breasts are browning in the pan, slice the peppers, onion, mushrooms, garlic. Open the cans pour the glass of wine. When the chicken has cooked 4-5 minutes per side and is nicely browned, remove from pan and set on a plate. Set aside. Add a dab more oil to the pan to get hot, when hot add the onions and peppers and stir-fry for about 5 minutes until you can see them getting tender. Next add the mushrooms and garlic and sauté until they start to get tender. Pour the glass of wine into the vegetables and boil until the liquid has been reduced by half or so. When reduced add the can of chopped tomatoes, oregano, basil, chili flakes and pinch of bouillon cube. When the pan is at a boil return the chicken breasts and juice on the plate back to the pan and continue cooking for another 15-20 minutes with a lid on. Serve over rice when done. This is the most adaptable throw it together thing you can make. You cannot mess this one up! Just get your feel for the ingredients and add an extra bit of milk, take away some bread, and voila you have a delicious anytime sweet treat, I made mine with a leftover loaf of whole wheat bread, and soy milk which adds to the fibre, also adds less fat and calories with the soy milk. Slice the bread and dice it into 1 inch cubes, and leave them in the casserole dish you’re going to cook the pudding in, you want to dry it out and make sure it’s stale before you put it in the custard. You can leave it out all day if you’d like. But 1-2hrs should be good. In a large bowl mix the milk, eggs, cinnamon, vanilla and nutmeg until the mixture is completely incorporated. Next add the drunken raisins and about ½ of the liquor if you soaked them. When your bread is stale and ready to be combined with the pudding mix, add the bread pieces slowly to the custard and press it down and make sure it all gets soaked in, and that there are no dry pieces of bread. Extra liquid is ok but you want to make sure that there is enough liquid to soak into each piece of bread, so by doing it slow you might not need all of your bread. Pour back into your casserole, and make sure any extra liquid is all poured on top of the bread. Bake for 40-50 minutes at 160C or ~350F. This can be served with custard over the top or ice cream if you dare.